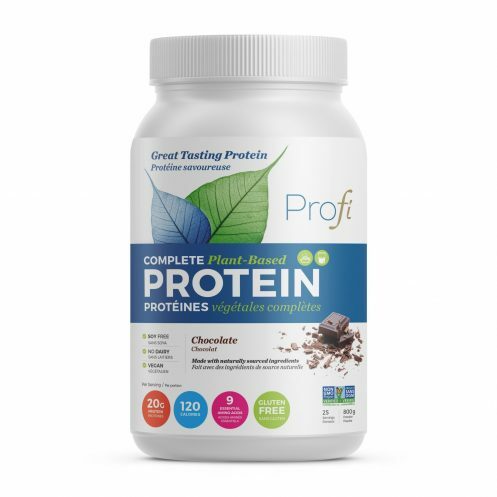 PROFI Chocolate provides a convenient and delicious way to boost your protein throughout the day. It’s rich, chocolatey flavour will satisfy any indulgent craving without the guilt! Ingredients: High protein composite (pea protein, whole grain brown rice protein, natural flavour, chickpea powder, lentil protein, high oleic sunflower oil), Cocoa, Natural flavour, Salt, Potassium chloride, Guar gum, High oleic sunflower oil, Stevia leaf extract. Fuel your day with PROFI Chocolate protein powder! I tried a sample today of the Chocolate. I used a cup of 1% milk because most plant based shakes are gritty, and because I only used a shaker bottle and didn’t blend it, it was a little gritty but nothing compared to some of the ones I’ve tried. I also found it to be a little sweet with was a nice surprise as well. Only downside is that it’s a little pricey. I got a sample of this. I added a banana because some of these shakes can be pretty terrible. This one was good. A little on the sweet side, but I like that. Would definitely buy this one. I got a sample of this from a vegan festival – it’s hands down the best vegan powder I’ve had. It tastes great and isn’t gritty. I look forward to getting more! I have gone through 3 tubs of this and plan on ordering my 4th very soon! This is the tastiest, best textured protein powder I have EVER had. I blend it with just almond milk, in smoothies and in oatmeal and pancakes!! Thanks Rhys! 🙂 We are so glad that you love it & thank you for being a loyal customer! I tried the sample with milk and banana and I love how it tastes and I like the sweetness of it too. 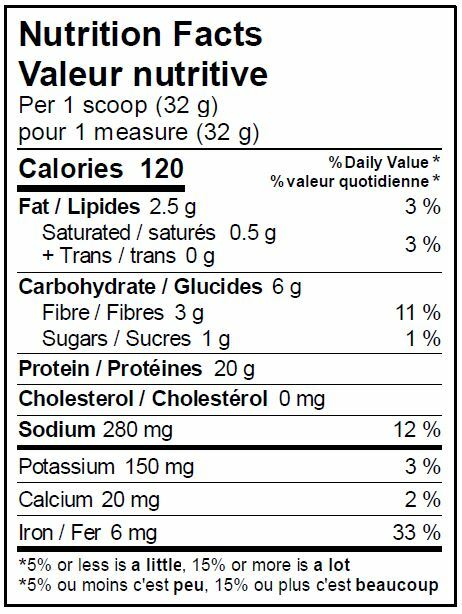 This protein shake had a great chocolaty flavour too it. However it had a very chalky consistency to it that made it rather unpleasant. Hi Vanessa, thanks for your feedback! We will work to improve on this in the future! Loved it tried the chocolate with 1 cup of 2% milk and added 1/2 banana and it was amazing. One of my favorite plant based protein powder! I mix it with almond milk and it’s like a chocolate milk, a nice treat! Also super good blended with a banana and peanut butter! This is the only vegan protein powder that I’ve tried that is tolerable on its own with water. I really liked the taste! Great addition to any breakfast smoothie with banana, vanilla yogurt and almond milk! I got to try a sample of this protein powder. I really liked it! Normally I don’t like chocolate, because it always tastes fake, but this was good! A little sweet, but after I mixed it with banana and Greek yogurt, it was a lot less sweet. The texture was good, not gritty like other protein powders. I’d definitely buy this again! I got a free sample of the chocolate from Profi, and love it! I mixed a teaspoon in with greek yogurt, soy milk, a tbsp oatmeal, frozen banana chunk, + a tbsp of soybutter. 🙂 very tasty! It. Mixed up great in my smoothie blender. I like the sweetness. I would definatly purchase! Thanks Kim! 🙂 We’re so happy you enjoyed it! This is a great product. I love that it is GMO free, vegan and that it uses simple, quality ingredients. The best part is that it really tastes great and has a nice texture to it. If there was one thing I could change, it would be to replace the Sucralose with Stevia instead. Other than that, great job! I really love this protein powder!!! I tried a free sample of this and didnt like the flavour at all compared to my usual shake. But I am not vegan so maybe its good if you are looking for that. HI Gm, thanks for your feedback! We appreciate it! I tried the sample with water and I will buy this product for sure! It would be great if you could substitute the sucralose… Thank you! Thanks so much Isabelle! 🙂 We are currently looking into the sucralose issue, so stay tuned! I ‘m hesitate to try new protein shakes because some taste really chalky and have a noticeable artificial flavor. The taste was better than expected and mixed up easy and I only used water. I was impressed and would recommend. I absolutely love this chocolate vegan protein and I love that I can get it shipped to my door!! A really great tasting protein powder without being too sweet or chalky. Would definitely recommend as a plant based protein powder! I really like this product, but I think I might purchase the unflavoured because I can add any favour I want to it. I love that it is vegan because I am trying to cut down on animal protein as much as I can. Thank you for the free sample ! It is a great way to try out products new to you. I tried a sample last year at vegfest and I’ve been taking chocolate protein ever since, the best!! Super great taste and very smooth. The chocolate is not too sweet and tastes great when you add fruit to it too. I had a hard time drinking this, the flavour is very off to me. I received a free sample of the chocolate flavour and mixed it with 1% dairy milk, and it is slightly gritty and has a strange taste to me, that is hard to describe. I couldn’t finish my cup and had to dump it. Sorry But I wasnt impressed with it. I found it to be super powdery and overall gross. I tried a sample pack of the chocolate flavour. It tasted great! I loved it. The only downside was how gritty and sandy it stayed. Even after tons of shaking it still didn’t mix in completely. Next time maybe I’d use boiling water and try it as a hot chocolate. Thank you for the sample. I tried it this morning for breakfast with a small banana and cold filtered water. It was not gritty and tastes delicious. It fueled me until lunch with no cravings in between. J’ai reçu un échantillon que j’ai essayé et j’ai bien aimé le goût!! Mélangé avec une banane et du lait d’amande.. C’étais sans arrière goût, ce qui arrive rarement avec certains compétiteurs. Je vais l’acheter assurément!! It was really good chocolate favour very creamy which I didn’t expect I would recommend!! Great taste and texture. Would purchase again. I got a free sample in the mail and it came with a pamphlet with some recipes. I tried my sample with banana and almond milk and it was a delicious treat! I love adding protein powder to my smoothies in the morning and profi is a delicious addition. Thanks so much! We are so glad you enjoyed it! I received a free sample of the chocolate. I added almond milk, Tbsp of pb and half a banana. Blended it. Still tasted some grit which I am not fond of but the chocolate tasted nice enough. Unsure if I will actually buy the product but it is in line price wise to similar products. I tried a sample yesterday and it had good flavor and was not gritty like some protein is! Definitely will be getting a BIG container of this one! I received a sample of the Chocolate flavour in my monthly Little Life Box, and I loved it, so I’ve ordered a 800g. I’ve tried many protein powders (like Shakeology and VegaOne) and this one is the best. I love the taste! I have used this to enhance my healthy eating habits and I am amazed at how much my nutrition has improved over the past months. I find myself feeling more energy and wanting to make healthier choices. This shake daily has taken the guess work out for me! I’m a smoothie and go person. Being a busy mom, I need something quick and nutrition packed. This was an excellent addition to my morning shakes. Creamy, smooth, and super tasty! Awesome protein powder! I was nervous mixing it with just water and when I did, I was pleasantly surprised at how tasty it was! Looking forward to adding this protein into my weekly routines! i was introduced to this product at a vegan show. i can’t believe how great it tastes and all the benefits it offers. i’m so glad to have found it that i’ve now repurchased it!! I haven’t tried many protein drinks, but this one was great! No grittiness and the flavor was good! I tried a sample of the chocolate shake at VegFest Ottawa, and loved it! I bought some recently, and it’s better than any chocolate protein I have tried, vegan and no vegan. It is sweet but doesn’t just taste like sugar. It takes like a milkshake without leaving you feeling gross! I will mix with just water, or blend it with almond milk, spinach and carrot and banana, and the chocolate hides all the veggies! I received a sample of the chocolate flavoured shake by Prophi and the taste was amazing. I loved the amount of protein and was an instant customer of the product. I used a cup of 2% milk and mixed the packet. It was a nice consistency, not gritty. The flavour is nice and refreshing. Not too bold and was similar to chocolate milk but not as sweet. I now drink one every mornings and I’m sure my body is loving me for it. I wish it had stevia. The fake sugar bothered my stomach. Please put stevia instead. Hi Natalie, thanks for your feedback. We apologize that it did not sit well with you! We had tried a variation of the product with stevia, but the flavour was just not there, it became very bitter! We are always on the lookout for new ways to sweeten our products, so stay tuned! I tried the chocolate and I loved it! I mixed it with peanut butter and banana after a workout and it was delicious and filling. I enjoyed the taste. It mixed easily. The fact that the produit is vegan is an absolute plus. I will continue using the product during my training. I am glad to have been able to sample it for free it enable me do discover a new product that I will continue using. Thanks. J’ai aimé le gout. Le mélange se dissout facilement. Le fait que ces protéines soient vegan est un plus. C’est un produit que je vais maintenant continuer d’utiliser lors de mes entrainements. Je suis bien contente d’avoir pu faire un essai gratuit, cela m’a permis de découvrir un produit que je vais continuer d’utiliser. Merci. Had the chocolate sample after a workout. Mixed with water, tasted great. Would definitely look to buy more. This product is delicious and filling. It helped me meet my daily requirements for protein and other nutrients and stay healthy while training for athletics. I would recommend this to anyone who is concerned about their nutritional requirements and training for any goal. By far the BEST protein my family has ever had!!! I still can’t believe that it is plant-based!! My daughter has a severe allergy to tree nuts, so finding a protein that is ‘nut-free’ was difficult. I was so happy to stumble upon Profi!! Not only does it taste AMAZING, but I know that it is super clean and safe for my kids. I add the chocolate protein to their pancakes for breakfast and they are incredible. Honestly, such a great product! I am so thankful for this brand!! Tried my free sample and I was really excited to receive it because i’m working on a low carb way of eating and this fits right in. It was rather gritty, possibly I didn’t mix it well enough. I’m not a fan of the sweetener, leaves an odd taste ..but I understand you are working on it and I will definitely try again if this is changed. Thanks for the sample !! I loved it and getting ready to place another order! I received a sample of chocolate flavor. I mixed it with water as suggested and it was quite nice. A good chocolatey flavor without the usual ‘phony’ taste of other protein powders I have tried. I wish I had blended it into milk as that would have been extra tasty! Great option for a vegan protein powder and a reasonable price range as many protein powders come from animal based sources and cost similar amounts or more. The texture is a little grainy, similar to other high level protein powders, but if you take protein already you’ve probably experienced that texture frequently. I prefer a more creamy chocolate taste so while it says add 1 cup of water, I added almost a full shaker of 0% totally skimmed milk and found the taste perfect. The taste was definitely better than other protein powders I’ve tried, though it’s very sweet so if you are sensitive to artificial sweeteners or don’t like sweet flavours, you might not like it. Suitable for diabetics and the calorie count is very reasonable! I mixed my free sample of Profit chocolate with water as the directions indicated. It mixed well. It was a little gritty and it left an oily after taste, but otherwise was okay. I like the fact it is Canadian. I would rate it a 4. I received a sample of this product. It mixes good, gave me the protein I needed fast that morning and the taste was ok. But I would not buy it because it has sweetener in it. I received a free sample This product has very good taste and so easy to prepare .I will definitely being buying some .I recommend this product . I received a sample of this a few weeks back. I used it in a smoothie – mixing it with a banana, peanut butter, water and a plant based milk. It tasted fantastic. There was no gritty or lathery texture to it – and it didn’t leave a weird after-taste. Love the fact that it’s Canadian made and would definitely recommend to others. I really tried to enjoy this product but I could not get over the after taste. I’m very sorry! Hi Judy, no problem! thank you for letting us know. May we ask what it was about the taste? My partner and I LOVE this protein powder! We were so impressed by the taste and lack of grittiness when we first tried it at the Vegetarian Festival here in Toronto that we haven’t been able to buy anything else since! My partner mixes the powder with water while I choose to include a scoop of it into my smoothies every morning. We’re huge fans! I absolutely adore this protein powder! I always mix this product with 650ml of almonds milk and it tastes delicious. It is the best protein powder and I would definitely recommend this product to everyone. I got a sample of the chocolate one to try and I liked a lot. It tasted good and not chalky. I added a bit to my smoothie (berries, spinach, almond milk, probiotic powder) and it gave it a nice smooth chocolate taste. Would love to try other flavours. Surprising good for a vegan protein powder. This is easily much better than others I’ve tried. The chocolate flavour wasn’t weird and the texture was pretty good. Thanks for letting me try before I buy!!! I received free samples of the Chocolate flavour; I added 1/2 a banana and instead of water used 2% milk; the flavour was fantastic – a bit on the sweet side but I love sweet!